Some fruit trees and shrubs cannot pollinate themselves, or if they can, then it's not highly effective. In this case, a different variety must be planted nearby to ensure a large harvest of fruits. 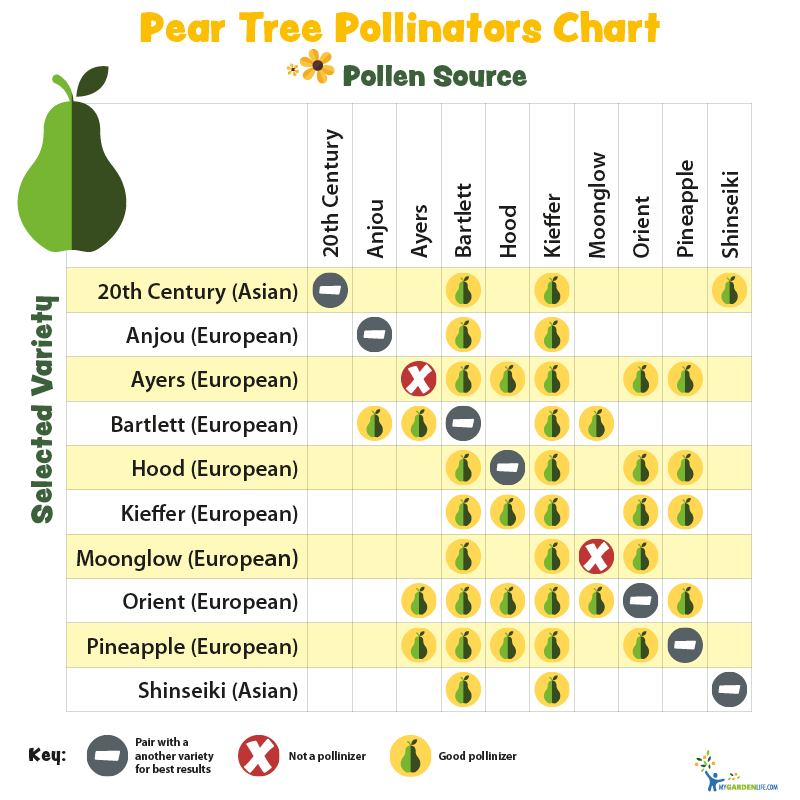 Plants that generally require a pollinator are blueberries, pears, apples, plums and sweet cherries. Other fruit trees and shrubs are self-pollinating and do not require another variety to produce a large crop of fruits. Nearly all strawberry, raspberry, grape, blackberry, peach, nectarine, sour cherry, and apricot varieties are self-fruitful. In this case, no second pollinizing plant is needed. When a fruit tree can't pollinate itself, you need to partner it with another, different variety that blooms at the same time. 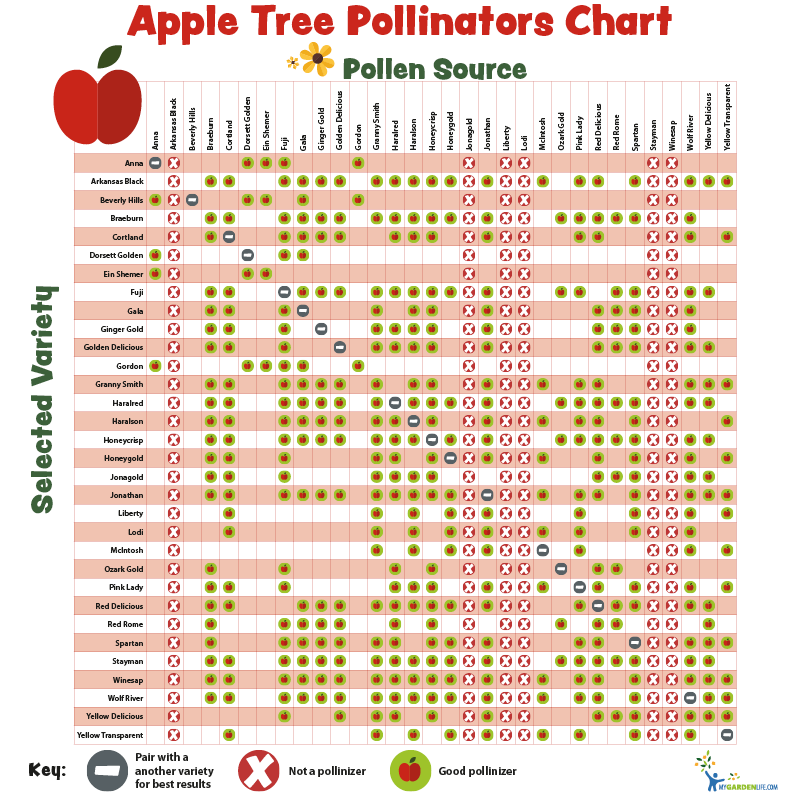 Apple - The pollinator partner for semi-dwarf trees should be planted no more than 50 feet (15 meters) away. If you have a dwarf tree, then plant the two varieties less than 20 feet (6 meters) apart. Blueberry - Plant a different variety tree no more than six feet (2 meters) apart. Cherry, Sweet - Plant a different variety tree no more than 20 feet (6 meters) apart. Pear - Plant a different variety tree no more than 100 feet (30 meters) apart. Apple - Produces fruit two to five years after planting. Blueberry - Produces fruit two to three years after planting. Cherry, Sweet - Produces fruit four to seven years after planting. Cherry, Sour - Produces fruit three to five years after planting. Pear - Produces fruit four to six years after planting. When in doubt of which variety to plant, most white-flowering crabapple trees are a great pollinator for any apple tree. Pro Tip: Triploid (three chromosomes) apples have sterile pollen that will not pollinate other trees. You should plant at least two different non-triploid varieties when growing a triploid apple. Triploid (sterile) varieties include: 'Arkansas Black', 'Jonagold', 'Liberty', 'Lodi', 'Spartan' and 'Winesap'. Half-High (Vaccinium corymbosum x angustifolium) – Best for the Upper Midwest, regions with exceptionally cold climates. Northern Highbush (Vaccinium corymbosum) - Best for eastern and northeastern United States with cooler climates. Southern Highbush (Vaccinium corymbosum x darrowii) – Best for regions with mild winters and higher average temperatures. Rabbiteye (Vaccinium ashei) – Best for southeastern United States with long, hot summers. Sweet Cherry (Prunus avium) – Best for eating fresh or for baking and preserving. Sour/Tart Cherry (Prunus cerasus) – Best for baking and preserving. 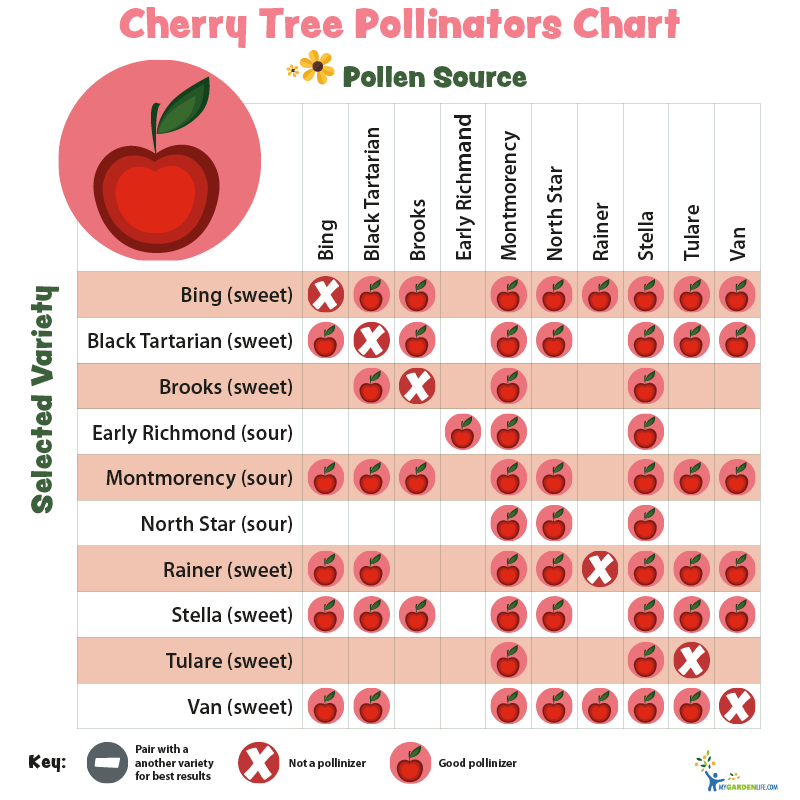 Pro Tip: Sweet and sour cherries can cross-pollinate each other, but ornamental flowering cherries usually won’t cross-pollinate sweet or sour cherries. Sour cherries are generally self-fruitful and don’t require another tree to produce fruits. European (Pyrus communis) – These trees produce sweet, juicy fruits that are the traditional pear shape. Asian (Pyrus pyrifolia) – The types of fruit produced by these trees are round and crisp (similar to an apple). 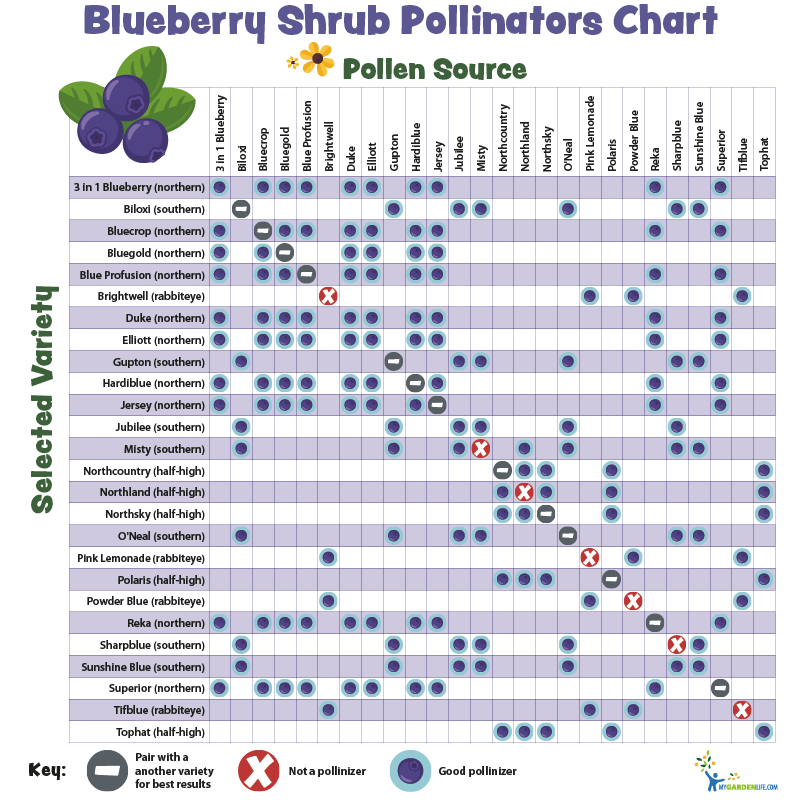 Not finding the pollination information you need? Comment below to ask our plant experts your question!